Condo Blues: Green Moms Carnival: Green Pet Edition! Rob’s World is a great friend to many in the Green Mom’s Carnival. He talks about why he adopts older pets in I am an Adoptive Green Mutha! You don’t need to be an adoptive pet parent to help a shelter animal find their forever home. The Green Phone Booth posts how non-pet owners can get involved in When Good People Do Nothing. 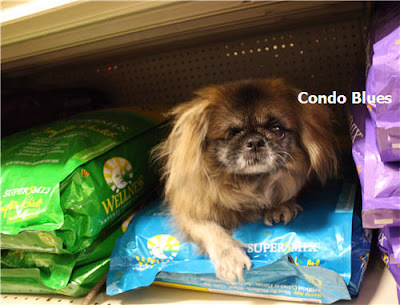 My apologies for including this entry from Condo Blues because it was part of a contest entry (we didn’t win.). However, Blitzkrieg’s Abuse, Adoption and Rehabilitation Story is important because explains why I am such an advocate for shelter dogs, Blitzkrieg's amazing personal journey from fear aggressive dog to confident athlete when so many said it couldn't be done, and how adopting this sad little dog kicked parts of my life back in the green direction. You should read my story because there are eleventy bazillion photos of me in it. To be fair to everyone else, read their posts twice! I’m so glad Nature Moms Blog submitted The “Green” Care and Feeding of Reptiles for this month’s carnival to remind us that lovable pets come in all shapes, sizes, and species. Big Green Purse explains why green living is just as important for pets like her cat Midnight, as it is for humans in Green Pet Care. Speaking of green pet care and non-toxic pet products, I’m hosting a giveaway for a nontoxic dog and cat urine cleaner (I found it works on little kid piddle accidents too!) in Condo Blues Clean + Green Pet Cleaner Giveaway! Fleas and ticks can be a problem for most pets and pet owners. 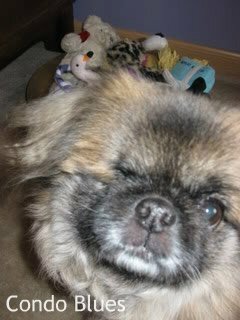 Groovy Green Livin teaches how her dog Milo ditches the toxic and caustic remedies while staying flea free in Natural Flea and Tick Prevention for Pet. My favorite sun spot is in our flower beds. That's why Lisa gardens organically. Blitzkrieg’s favorite kitty friend Arya from My Plastic Free Life writes a post about her plastic free life – kitty style! In Kitty Love, by Soots & Arya Fair warning! The kitten photos are adorable. I die! Retrohousewife Goes Green describes how her rescue dog Patience enjoys the good life in Greener Dog Toys. 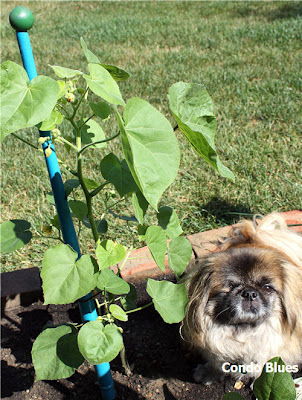 Moms Rising has many great tips for greening the pet in your life in Tips Tuesday: Green Tips for Pets. If you’ve ever walked into a pet store with the intention of going greener but were not sure where to start Big Green Purse helps you out in EcoFriendly Pup Products Beneficial to the Earth, Your Pet, and Your Lifestyle. 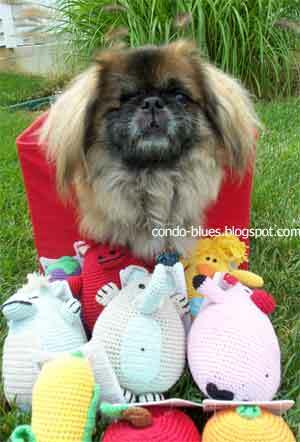 We shared these hand crocheted toys with our rescue dog friends! Pet food is largely unregulated. Some pet food companies, but not all, use questionable ingredients in their products. 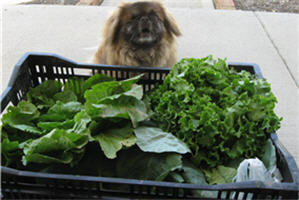 Groovy Green Livin explains how to tell the good, from the bad, and the ugly in 8 Tips for Choosing Healthy Dog Food. Of course, you may want to stop buying premade cat food altogether once you read My Plastic Free Life's post on Homemade Cat Food. Blitzkrieg is jealous Soots and Arya get homemade food every day! Blitzkrieg may not get homemade dog food but he earns plenty of homemade treats. Check out Condo Blues Make Dried Sweet Potato Dog Chewies for directions on how to make this sweet treat for your pet! Some animals have constant health issues. Did you know your pet’s food bowl might be part of that problem? My Plastic Free Life tells us why in Cat and Dog Acne from Plastic Bowls. I don't need a dog bowl. I'll eat all this natural dog food right in the store, thanks. Organic Mania asks Can Pets, Like Kids, Turn Adults into Greenies? My hand is in the air. Is yours? Purrfectplay explains that body burdens effect pets just as much or more than humans in Toxic Burden and Our Pets. The Best of Mother Earth pokes a little fun at the lengths we (including herself) go for the pets in our lives in The Warm and Fuzzy of It: Pet Ownership. More adorable Miss Kitty pictures – full steam ahead! My Plastic Free Life is a plastic free crusader and soon to be published author! Her plastic free efforts come full circle in My Cats Eat Plastic. Do you know that some CSAs deliver directly to your house?! It's like Christmas every week!! Pets antics make us laugh. Sometimes I think our antics make our pets laugh even harder. I had to close out this month’s Green Pets Carnival with My Plastic Free Life’s hilarious story of how green living almost - literally - bit her in the tush in How Swheatscoop Led To a Rat Living In My Toilet. Yes. A rat. In the toilet. ICK! This concludes the Green Pet edition of the October Green Moms Carnival. Please join us in November for the How to Be a Green Consumer – Black Friday Edition Green Moms Carnival hosted by Eco-novice. Thnak you for hosting Lisa- Blitzy is a very lucky little dog to have found you and Mr. Blues. Lisa - we can always count on you to bring enthusiasm and style to the things you do - this month's carnival hosting is no exception. Lisa, thanks for hosting this great carnival! I've read several of the posts, already and can't wait to dig into the others. When do I get to meet Blitzkrieg?? What fun! Thank you for hosting, Lisa. I loved reading about all the pets - we green moms don't usually talk about green pets. Nice to do something a little different.